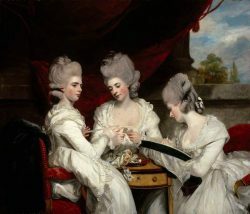 For the first time in over 170 years, masterpieces from a once famous collection at Strawberry Hill House will be temporarily reunited and displayed in their original positions. In 1842, after Horace Walpole’s death, his collection was dispersed worldwide. In October, many will return home, including Joshua Reynolds’ painting of Walpole’s nieces which will be rehung in the Great Parlour. The Society has organised a private guided tour for this once-in-a-lifetime experience at 10.30am on Monday 22 October, just three days after the exhibition opens. To book a place email visits@richmondhistory.org.uk and send a cheque for £15 payable to the Richmond Local History Society to Rose Constantine, 6 Ormond Road, Richmond TW1O 6TH. No tickets will be issued, but Rose will confirm attendance by email. This entry was posted on 22 October 2018 by Robert Smith.